Farmers here all using raising raceways where depth lowered to about 4". For smaller lots of a couple thousand fish I use 40-gallon breeder tanks with depth set at about 2" making so residence time very short with need for a lot of flow or current. Yeah I screwed up. But they are apparently feeding down there as I scoop a couple hundred up with a fine mesh dip net and put them back into a floating basket. There air bladders must be O.K. as they have no problem staying in the the top of the basket. if I do this again (not sure it's worth the trouble and should just buy juveniles to stock the pond like I usually do) I probably set up a rectangular shallow tank. It is a very cool experience even if it was not as productive as hoped. And expensive. Chiller was $500.00 and iron filter which isn't working as well as it was in the beginning was $1500.00 and almost another $500.00 for installation. Nitrites just won't go down unless I do a water change. Ammonia climbs to 1.0 mg/l. One day the nitrites were off the charts. It's as if the nitrobactors just don't want to get going. I couldn't do worse if I was adding a bactericide. I increased the CP (Set Point) on the chiller to 58 F. yesterday from 53 F. It's hoped the bacteria may be more active at a little higher temps. The chiller will climb to 60 F. before it kicks in. Sort of strange as my garage tanks never had a problem, even at colder temperatures. Probably because they were well established for months before they gradually cooled down. Yes if I had to do it over I would have cycled months before i got the eggs. OTOH I wanted to, but the tank was not free due to waiting on four high schools to get their act together (cycle tanks) so I could rid the tank of tilapia.No good deed goes unpunished. I will not be working with the schools next year. They are on their own. 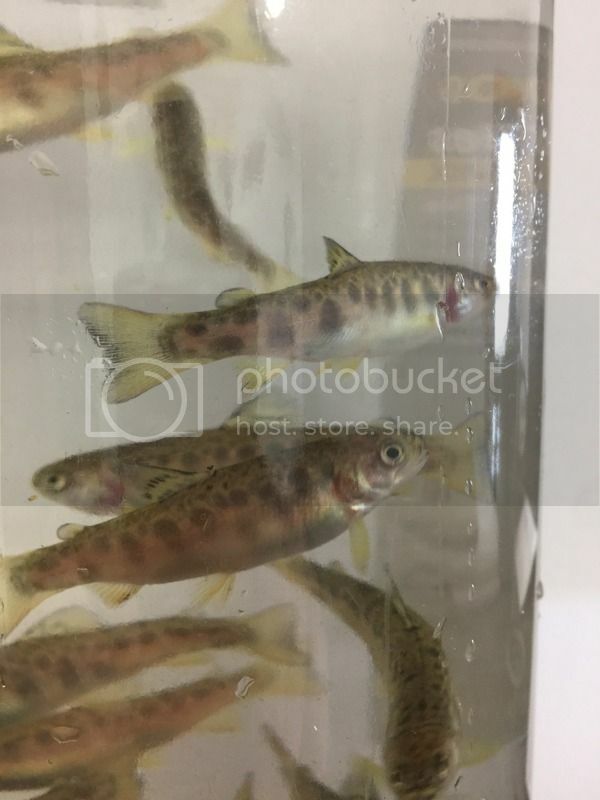 I sterilized the filter with the tilapia before I started the cycling process for the trout as I didn't want to take the chance of exposing the trout to any pathogens or parasites. Took the check valve off of the water line that feeds the bottom of the sand and gravel filter hoping it will increase flow which could help. It seems a little stronger but not much stronger. Difficult to measure the flow. I will keep doing two water changes per day and adding an ammonia, nitrite remover. I'm hoping the spike in nitrites means the system is close to really being cycled. I think if I do this again I will use a fluidiized sand filter for bio for more surface area. All the commercial coldwater producers use sand filters if they are not doing partial ras. Other than start up failures after power outage, FBF are amazing. I think I was getting about 10 pounds of fish per pound of sand at one point. They were blue tilapia however from Rex. There were 3 or 4 sponge filters in there as well, but they got moved out to fry rearing tanks as needed. So the temperature was warm but the feed was heavy too. I have no issues with warmer water systems once they are cycled. Almost idiot proof. I have a tank that has crappies in it that I am guilty of overfeeding and have to clean the bottom of the tank (150 gallon circcular ras tank) every couple of days. I can go several says with a dirty bottom to that tank and there is not so much as a slight increase in ammonia or nitrites. In fact only do a water change every four or five days. Could easily get by with out one for a week I'm pretty sure. Wouldn't have any issues with power outage with FBG as I have an inverter back up. 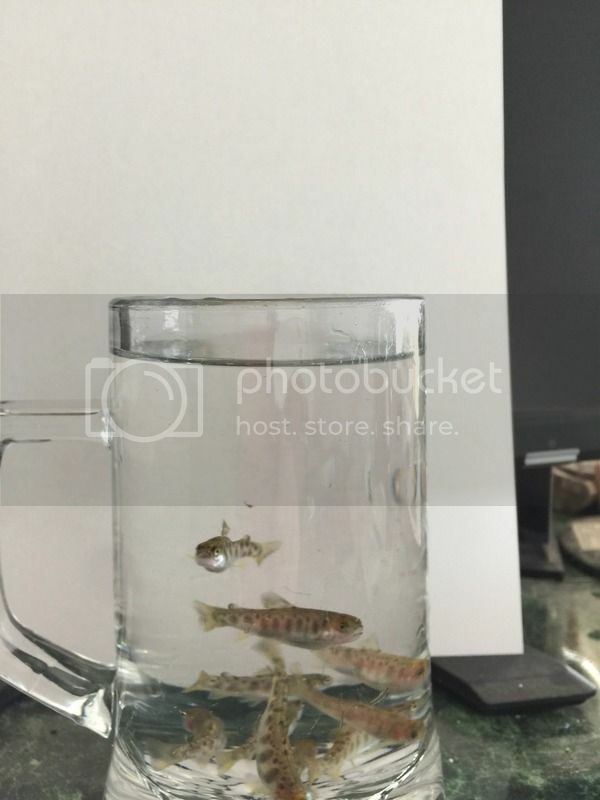 A couple of pictures of some I put in a glass mug for a photo op. One looks like he is defiantly looking at the camera. Can anyone tell which are brook, brown, tigers yet? Look all the same to me at this point. As you can see mechanical filtration is quite good as this is the water straight out of the tank. Absolutely adorable. Did your surplus egg guy end up following through? If not, I hope you have a report for us on what trout roe tastes like! What are the attributes you look for in this line of work? I saw in an earlier post that you were concerned about weight gain - I did not realize that the true shape of the fish was retained at all by the time the taxidermist. At what point do you start culling fish that you recognize will not have desirable traits? No the surplus guy dragged his feet and never called back, and I finally told him via phone message the deal was off once I realized he needed a permit to import the eggs into Ohio. To do that he would have needed to request copies of the health records I got from my supplier, which he never did. I wanted to compare notes on how he was going to hatch the eggs etc. He told me he was just going to dump the eggs into a pond and hope some would hatch, I was not impressed. For all I know it may have been a set up. I had a bad experience with an Ohio C.O. a few years back that also ran a fish farm (in his wife's name as it was illegal for him to do so otherwise). I didn't do anything wrong, but drove 2 1/2 hours to purchase fish and he suddenly refused to sell any to me. At first he wouldn't even come out of the building. No explanation and told me to leave. A friend from Ohio that was with me, thinks he thought I may become a competitor, which is ridiculous. The friend says he's paranoid of any potential competition. I am hanging on to as many as I can as there is no guarantee I may not have problems in the future. As far as when to cull for desirable traits, I've already done that to some extent. Had a few that had one head and two bodies, and other deformities, and they were flushed down the toilet. If I see any with malformed fins or other defects they will be culled out too. I will also cull out any that don't seem to be growing as fast as the others. Another pic at about 3 1/2 inches. When they hit 4 inches and the pond water has warmed up to at least 50 F. I will put them in the outside pond in a circular floating cage. When they reach 5 or 6 inches will be released free swimming into the pond. And another one. I am a little concerned some may have short gill covers which can be caused by a lot of things. OTOH I was told the gills can be quite transparent on the ends at this stage so it may just look that way on at least some of them. Gill covers do look rough. Cull those with obvious deformities. Next round lower stocking density and increase water turnover rate during first 60 days. Makes sense. This was my first attempt and I will definitely be tweaking things next time around. 1. Have the system cycled long before the eggs are added at the same temp as the system. I had it cycled at 65 F. and then got the chiller just before the fish and dropped the temp to the low 50's. I'm still dealing with nitrites higher than they should be. It appears adding salt and using the ammonia/nitrite/nitrate remover is helping. 2. Use an up flow fluidized sand filter for a biofilter vs. the plastic media. Even with 8 cubic feet of plastic media I don't think it's sufficient at the lower temps. It's no coincidence all the serious coldwater recirculating systems out there use fluidized sand filters for biofilters and warn about elevated nitrite levels, hence, the need for more surface area. Apparently the nitrobactors don't do as well at low temps as the nitrosomonas. (Or other species). 3. I need to do something about the iron filter I purchased and set up. It is no longer removing 100 percent of the iron. I think the company doesn't want to talk to me anymore. They won't answer my emails. They now claim my 7.5 Ph is not high enough and I need to add a $500.00 soda ash injection system to raise the Ph. Initially they told me 7.5 was fine. Should have hired someone locally! Stupid, stupid! Next go around consider adding a plastic barrel loaded with oystershell or dolomitic limestone that is down stream of current biofilter Water leaving biofliter will then percolate through the fixed media that has a buffering capacity associated with surface nitrifiers, especially those transforming nitrite to nitrate, will be growing directly attached to. If system impoinds then stir upper 4" to restore flow. I have 716 trout in the outside trout pond now. During a water change my pump started acting up so I decided it was time to put them in the pond. Originally put them in a floating cage as wanted them larger for free swimming, but decided to release them free into the pond as I missed a few zip ties and they were escaping the cage. Difficult to repair the cage with fish in it especially if you don't know where the opening is. OTOH I was leery of the cage as crowded in the cage with no flow to keep them occupied may have caused fin nipping. Most are hanging out under a small pier in the pond. I am feeding them three times a day. Due to low air temps the water has stayed in the 40's. I will not crank up the well until water temps are near the upper limit and/or I start reading ammonia or nitrites. Doubtful of the latter as the pond is 100,000 gallons and water temp will be an issue before ammonia, or nitrites, due to the small corresponding biomass of the trout. I am in the process of adding staked lines around the pond to keep a potential Great Blue Heron out, although it hasn't been seen much this year. Will also cross some lines across the pond in case a Kingfisher shows up. 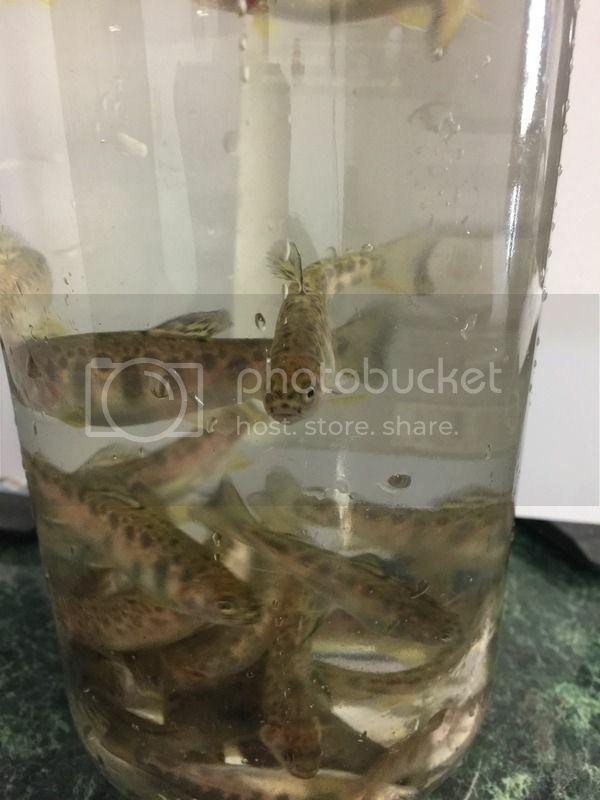 I was going to plant some of these into a local trout stream with the blessing of a biologist and the individual with my DNR that is in charge of permits before my pump started acting up, (716 fish is far more than I need), but the latter changed his mind at the last minute and wanted me to test for VHS. (Keep in mind the hatchery that supplied the eggs was tested free of VHS and numerous other pathogens,and my fish were reared in a closed system using well water.) That would be a cost on my part of over $600.00 so isn't going to happen. (Over $300.00 for the actual testing and another $300.00 to pay a vet to take samples.) 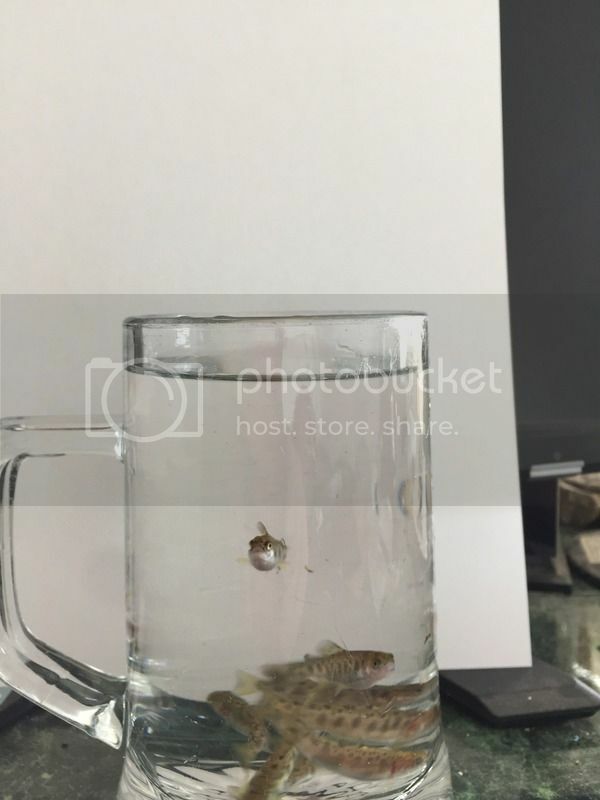 I can't justify giving fish away and shelling out money at the same time to do so. Apparently a trout club in the next county doesn't have to do the additional testing according to one source, but I'm not going to make waves as I am at the mercy of the DNR for permits. Edited by az9, 04 April 2017 - 08:32 AM. Don't believe I have a predator issues as I have staked line up to keep herons out, and it's close enough to the house both I am my parents that live next to me have been keeping an eye on the pond. No herons or kingfishers that we have seen. Have been throwing out sinking feed up to three times a day with hopes I am getting it to them. I suppose there is some natural feed but my concern is this small (3 1/2 to 4 inches) they need to eat frequently. If pond forage is of high quality and quantity, then they may drift away from feeding station. Swim with them and see if you can find them. Generally, the abundance of very good eats is short-lived so fish will some back to feeding station if you keep putting out a little on same schedule. With Bluegill as few years back I watched how Hexagenia hatches pulled even large Bluegill away from feeding area. The Bluegill maintained feeding territories during those events and most had hugely distended abdomens.